Now, I do mean cheat, and not only on your spouse, cheat on everybody! So what do I mean by cheat if not engaging in a clandestine affair of hearts or loins…or both? I’ll use the photo accompanying this photo tip to illustrate. What you are looking at is a snail on a green rock in a tide pool. I came across all these things while beach-combing at Acadia National Park in Maine. 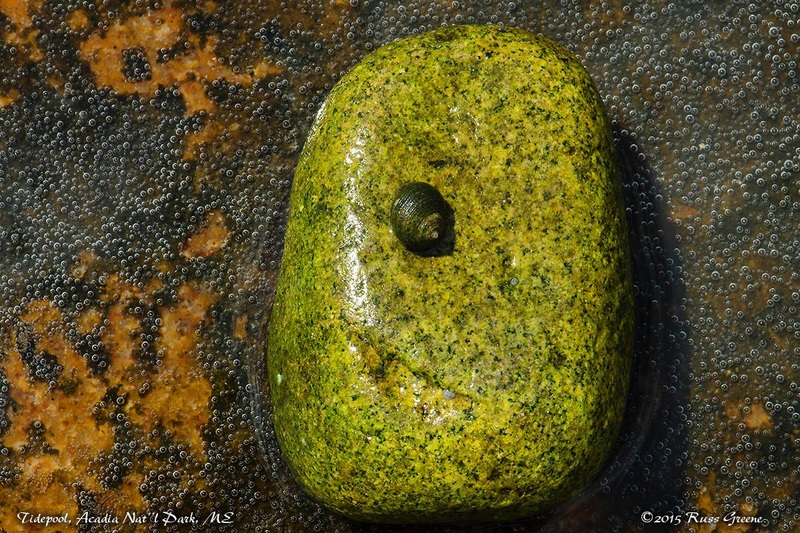 The snail and the rock were found as you see them: the rock greenish from algae, plankton or whatever, and the little snail happily clinging to it. I presume it was happy or it would let go, right? The bubbly little tide pool is shown as it was found too. I’m uncertain what was in it and why it had all those little bubbles, but everybody likes bubbles. Don’t they? Now here is where the cheating comes in: I found the snail and rock in once place, but the tide pool in another nearby. The green rock caught my eye because it was the only green one in a field of gray rocks. I liked that contrast but not so much where the rock was, so I picked it up and moved it about, setting it down in different places trying to find one that I thought made for an interesting photograph. Within a few minutes I found the bubbly tide pool, set the rock down, thanked the snail for hanging around and took this shot. Did I cheat? Well, you be the judge. I kind of like this shot but you don’t have to. The point I’m making, the one about cheating, is that there is no law that says you can’t change things around to make a photograph. Maybe in forensics or scientific work there is, but when it comes to photographing things just for pleasure, art or entertainment you have my permission to cheat on your spouse, and everybody else, for that matter! Your antics beat out Scarlett’s ! That’s pretty high praise! I think. Hahah. You suggested peeing on the rock, not someones spouse, right? Maybe what I meant was to cheat on your rock! Hah! Yep, that’s what I’m all about. LOL.